Marvin Hughes is currently a junior in the Legal Studies department with an emphasis in both homeland security and law enforcement. He is minoring in Intelligence and Security Studies. 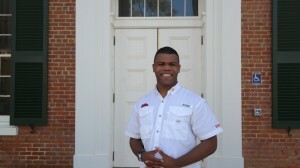 During his undergraduate career, Hughes has participated in several organizations such as Naval Reserve Officer Training Corps, National Society of Collegiate Scholars, and Alpha Phi Sigma Criminal Justice Honors Society. He is currently a reserve police officer with Oxford Police Department. “To be a School of Applied Sciences Student of the Month is truly an honor,” said Hughes. He was nominated by several professors in the legal studies department such as Drs. David McElreath, Stephen Mallory, Carl Jensen, Lorri Williamson, and Michael Wigginton.